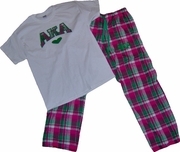 Soft cotton tees and comfy flannel bitty boxer shorts come together for this totally adorable sleep set. Stitched on flannel letters and twill heart coordinate with the shorts - all in your organization's colors. Choose your shirt color too! Want something a little warmer? Upgrade to a hoodie or flannel pants or Both!! Bitty shorts are sized for junior fit. Royal blue and gold shorts will be standard boxer shorts. Pants, Tees and Hoodies are sized for a unisex fit. Upgrading your tee, you will receive a lightweight 8 oz. hooded sweatshirt - 50% cotton/50% polyester, with muff pocket and drawstring in the hood. Our upgraded sleep set is great for walking around on campus!